Can a Tablet Replace Your Laptop? Tablets have become tremendously popular in the last couple of years and many people have started to wonder if they can use one to replace their laptop. The answer might be yes, depending on how you are using your current device. Will you use the device primarily to consume data, such as searching the Internet, using social media, viewing files, playing games, reading books, etc.? If so, then a tablet might be a good option. However, if you rely heavily on your device for creating blogs, editing images or video, working with large documents and spreadsheets, and other business tasks, then you might find a laptop is still the better choice. Tablets can still help with business tasks but they are less likely to be robust (fast) enough for serious users and can leave them feeling frustrated. If you lean towards the lighter side of productivity, then an external keyboard is highly recommended. If you are always on the move for work or play and need a device with you at all times, then a tablet’s lighter weight and smaller size can be a big benefit. Tablets also tend to have good battery life, so you can go longer without having to search for a power outlet. Adding a data plan to your tablet increases the portability advantage, because you have a constant connection to the Internet. Adding a tablet to a Verizon More Everything plan is only $10 per month – a low price for such convenience. If you want portability but need a more powerful device, there are thinner, lighter, and smaller laptops available. These will cost you more but you will have the ability to carry out more tasks, and they are still lighter than the older traditional laptops. Some users may need access to more traditional software for work or school but most tablets don’t support these programs. If you need a specific program, see if there is an app version or a web-based platform that would work on a tablet. Apps are abundant and there are many alternatives for the more commonly used programs. Even if you do not need specific programs, it is still wise to visit the relevant app stores to make sure you can carry out the tasks that are important to you. 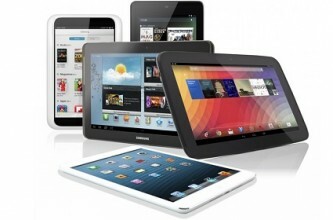 Have you made the switch to a tablet or are you considering it? What are the most important factors in your decision?